"As time passes within the known planes of existence, junctures occasionally occur when the Great Crucible of Life requires attention. In such a time, the Gods that attend the Great Crucible work to remove any undesirable elements and those parts that have risen to the surface and threaten to spoil the perfect purity of the melt. Yet, these parts are not destroyed, but are made subject to greater forces that break them down into new elements that can still be used in the Recipe of Life. When ready, the Gods slowly reintroduce these new elements, carefully watching for further signs of changes that would threaten to spoil the perfect melt once more...."
As players of the campaign and readers of this blog will know by now, such a time is now upon the worlds of the campaign in which Althéa resides. Certain "elements" have caused the Gods to re-examine the balance of power and magik that runs through the planes of existence and bring about a change, much like the Debacle once did in the world of Althéa. Ultimately, this will mean sudden changes for the peoples of the worlds, who suddenly discover things they once knew and took for granted are no longer known to them, or beyond their current ability. For some, this will mean an end to their striving for achievement, as they accept their own inability to cope with the changes, but for others, especially those that know no different, it marks the beginning of a new age, where the slate of achievements has been wiped clean, allowing any who are prepared to make the effort, have the chance to make something new of their lives in a way that the old era may have worked against them. 1) Skill and feats once honed and useful, are no longer the case. 2) The system of Colour Magik no longer exists. 3) Faith for the gods has become more personal. The changes throughout the world have also brought changes in the shift of power, but unlike at the time of the Debacle when the actual people who desired power were destroyed, this time they are left alive. And while some have drifted into obscurity, others, with greater desires, have picked up from where they left off and have even enhanced their positions by using the Changing (as it became known) as a means to work peoples' fears and manipulate them to their own needs. Any surviving characters of the old era begin in the new era at level 1 unless the great God of Balance, Vol, deems otherwise. All skills and feats known from the old era will have been forgotten. Only basic attributes will survive the Changing. Everyone must begin afresh. Most magik in one form or another will have lost its power, be it in the knowledge of spells, prayers or magik equipment. These are some of the main "elements" that were drawn out of the Crucible of Life and made subject to greater forces before being returned. Now, it is up to the peoples of the worlds to rediscover those Gifts of Life that help them to grow and to build again. While the basic elements of the magik of the old era have been altered, reconstruction of many spells and magik equipment will come into being once again, after the peoples of the worlds unlock the new formulae that works it. Of immediate note are the more obvious new elements that have appeared in place of the old: Essences. Somehow, their arising is tied to the disappearance of the old magik, and is of immediate interest to those who would learn of constructing enhanced weapons like those of old. Upon the world of Althéa in particular, there has come into being an essence not found upon any other world yet: The Life Essence. As its name implies, its power is somehow tied to life, and of all the essences, is the most mysterious force. Believed to be part of the very fabric by which life and true magik flows, its new presence upon Althéa has brought about some changes in the way spells can be cast. In the old era, to cast a Colour Magik spell, the wizard was required to either ingest Moon Rock of a certain colour or acquire a material component or focus to aid in casting the spell if it was "foreign" to them. Since the Changing, however, the formulae for many spells has changed and it has been discovered that those spells that once required such components are no longer required. The presence of the Life Essence upon Althéa has somehow replaced the need for Moon Rock and/or material components/foci - at least for Arcane spells. As the formulae for some spells have remained lost, new era wizards have suggested that the "lost spells" are part of what may be behind the power of the Life Essence and of some of the new formulae (spells) that have been discovered. So that while some spells from the old era may no longer be available, many have argued that the presence of the Life Essence may actually prove to be of greater value. The devout peoples of Althéa see the Changing differently. They see the Changing, or what they would also call the Darkening, as a time for a need of greater personal faith in a time of darkness. For them, their faith to their god comes first and should be renewed with greater vigour and determination, involving a throwing away of old attachments to the world and recognising an inner strength given to them by their god to do what must be done. To these people, their Holy Book is the only thing they need. While the carrying of a holy symbol may be useful as a means of recognition, it is no longer required in any prayers as a divine focus. So, much like their wizard counterpart, they too no longer require any focus other than their faith to be able to pray to their god for help in answering of the most common prayers. 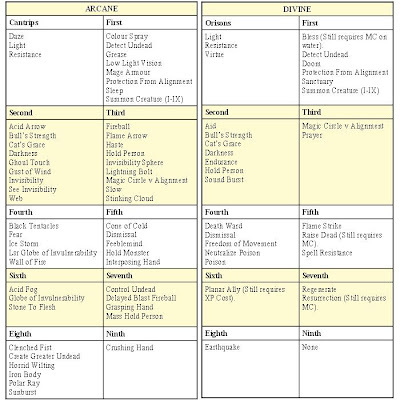 Note, spells that are found and powered by Arcaene Lore (even if listed above) do not require these components. However, special case incantations (neither memorised nor Arcaene Lore spells, but usually specially written scroll spells for an unusual situation or event) can still be found and their circumstances may still require other Material Components, Foci or other costs, such as XP to cast. 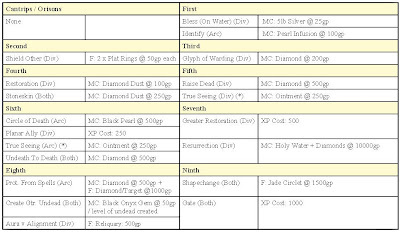 To find out more about extra components required, please refer to the spells section of the D20 website.